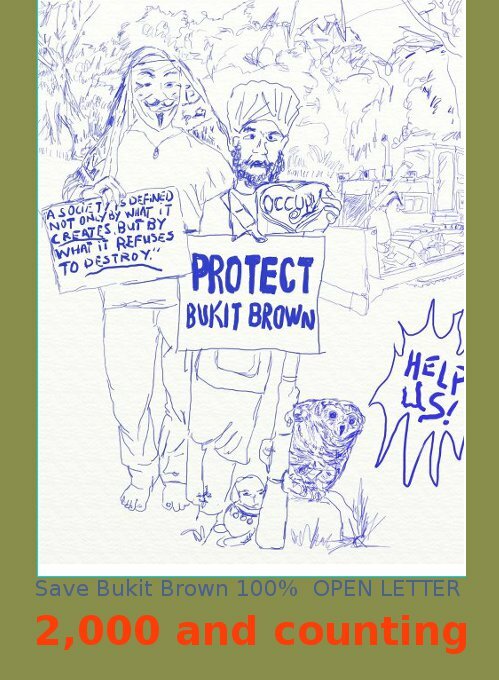 To save Bukit Brown 100%! An Update. Previously, The Economist wrote an article on Bukit Brown and it stated that there were 2,000 signatories to our Open Letter asking the Singapore Government not to build a highway through Bukit Brown. We have since collected more signatures, and will be releasing the numbers shortly after we have gone through the counting. This will demonstrate the number of people who find the development plans of Bukit Brown unpragmatic and insufficiently thought-through. Official plans by the LTA and URA to build that highway through Bukit Brown seem unchanged, despite consistent public outcry. SOS Bukit Brown’s initiative in talking to ordinary Singaporeans on the ground as we garner support to save Bukit Brown indicates that the highway plan remains highly controversial for several reasons. As such, there should be a stay on the exhumation of the graves and the construction of the highway. 1. The claim to require road space over Bukit Brown – This is in direct contradiction to the 2008 Land Transport Master Plan and the calls for input for a new Land Transport Master Plan prioritizing public transport, especially rail, by commuters and curbing the car population which makes up most of the vehicles on the roads. 2. The claim that the proposed highway over Bukit Brown is to ease congestion on Lornie Road – Much of the congestion comes from the PIE, as well as vehicles entering and exiting the PIE and it remains unclear how the highway through Bukit Brown that runs North-South will ease the East-West traffic along the PIE. 3. The claim that the proposed highway through Bukit Brown is to ease traffic with an increase in population – The National Talent and Population Division has not completed studies and discussions in regards to the upcoming White Paper on the future population of Singapore while a recent IPS study shows that Singapore’s population may remain stable over time, even with immigration. 4. The claim that the proposed highway through Bukit Brown will have minimal impact on the environment, hydrology, and possible flooding – The full details of the Environmental Impact Assessment for the proposed highway and its construction remain undisclosed. 5. The claim that documentation is sufficient to make up for the loss in heritage and to national identity – At a time when it is especially important to have public spaces and physical locations to draw all Singaporeans together, especially across generations, as a reminder of where we came from, our diversity, and the values of hard work and sacrifice we share with Singaporeans of an earlier age, it is evident that documentation of previous lost places have not been able to replace the physical places and it remains unclear how documentation of Bukit Brown is able to do so. 6. The claim that it is not possible to maintain Bukit Brown as a nature and heritage site – Many Singaporeans have been visiting and touring the area despite the fact that it is claimed to be abandoned and perceived to be difficult to access by public transport as the Bukit Brown station along the Circle Line is not yet operational. It is unclear why such trade-offs are necessary, reasonable or even practical. We hope that all Singaporeans, every one of us, including civil servants, MPs, and Ministers, take the time to take off our other hats and act in the interests of Singapore both for today and for the longer-term. Protecting Bukit Brown is in line with official plans for developing our country in a way that is socially and environmentally sustainable. Protecting Bukit Brown is a way toward the inclusive Singapore we all desire. For these reasons, we repeat our call for a moratorium on all proposed works at Bukit Brown.